Registration is underway for our summer history camps for kids! History Camp 2019 will focus on the decades of the 1950s through the 1990s—a different decade each day of camp. Come enjoy historical hands-on activities and games while exploring the museum exhibits and grounds. Campers can also attend our annual camp reunion at the NWA Naturals baseball game, Friday, July 12, at no extra charge. At History Camp, we always make new friends and have fun, but we also go home with more knowledge of history than we started with! Snacks are provided for both camps; lunch is provided for campers attending Session II. Space is limited for both camps; preregistration and payment is required. Registration ends May 31 or when camps are full. For more information, email education manager Judy Costello or call 750-8165. A limited number of scholarships are available. The application must be received by May 31. 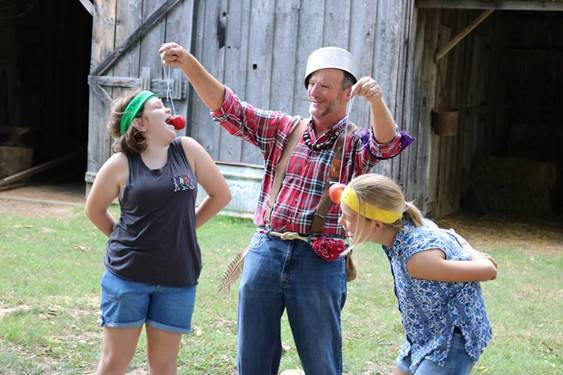 July 8–12, 10:00 a.m.–3:00 p.m.
Johnny Appleseed often drops by history camp to show us how fun apples can be.